Laurence Payot uses the public realm as a stage to make out-of-the-ordinary things happen. People are invited to embark on a journey to transform their everyday and bring their shared utopian visions to life. From inventing a new local folklore with the people of Dunstable, to infiltrating the digital realm with manifestations of a mysterious online tribe, her artworks take forms that connect people and challenge our perceptions of each other. Laurence has recently been awarded the prestigious SkyArts Ignition: Futures Fund, a one-year bursary by the TV channel SkyArts, and was shortlisted for the Liverpool Art Prize 2013. Her projects Re-Presentation, I Thought It was Real, Coincidence, and Living Sculptures (forthcoming) have all received Arts Council England Awards for All. Invited by Bracknell regeneration partnerships to create an artwork to reveal some of Bracknell stories, discover what is special about this place where you live, and about you. During my first visit I was amazed by the co-existence of everyday urban life and the wilder woodlands surrounding it, and I felt this was something really special that I wanted to explore. I imagined people living here as "the people of the forest", with hidden secrets about our ancient woodlands origins. This first walk is the first step of this journey of exploration. We're searching for something but we're not exactly sure what it is. You are our guides because you know the stories, you have the childhood memories... And we're here to highlight these, and present our findings in a beautiful way which I hope will mean something to you. There will be an exhibition of photographs, videos and texts in the city centre, which we'll invite you to. Tonight, we're going to walk from here to Bill Hill, from the town to the wild, and whenever you see something you'd like to highlight, you can stop the whole group and we will all look in the same direction with our head torches. Andy willsher, who is a fantastic photographer (photographed Amy whinehouse) and Tim Brunsden who makes beautiful films will document our walk, and might take portraits of you also. At night, dusk covers the world like lace would cover a body, revealing by hiding, making us look at the details, at the surface of things more closely, more intimately. Things appear in the moonlight with a glow similar to a dream, as if they gathered from the daylight imprinted memories and silent stories. Our individual lights will come together to create a larger source of energy, a collective glow, a consensus on where to look. Born in Metz, France, 1981. Currently lives in Liverpool, England. Based at The Royal Standard studios and gallery. Graduated from the Ecole Nationale des Beaux Arts de Lyon, France, 2005. "I am a socially-engaged Artist. My work is multi-faceted. I work with people in many different ways & across all areas of life & geographical & community contexts. Much of my work is ‘participatory’. 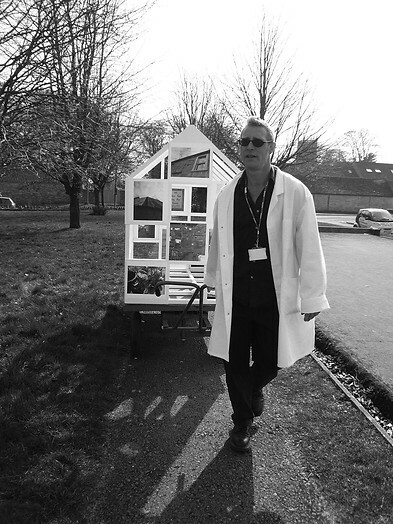 I naturally also work with place, locality & neighbourhoods & attempt to understand & reveal the inter-relationships between people & where they live. I seek that which makes here, there, everywhere or anywhere distinctive & special. I thus explore local particularity, identity, sense of place, community, connection & disconnection – the extraordinariness of ordinariness - in order to make a different sort of sense of it all. What emerges from my encounters & dialogues with people & their places depends upon the process; the deep explorations, the exchanges, the wonderings of minds & wanderings of feet, the conversations, the creative experiments, the research, the Artistic evolution & shared endeavour. also offer tangibility & an engaging presence to my work. through film & photography, music & poetry & special ‘publications’. Designers & Makers or Musicians & Film-makers as well as local residents themselves & other Project Stakeholders. – this, in itself, is a form of collaboration between myself & my students or, at the very least, it is a collective journey into unknown realms & one that I enjoy immensely."